Other distinguishing features: White skin, a lightning shaped scar on his head and a large red spot in the chest from the infusion of the nanites. Occupation:	Former strongman for organized crime. Operative for Neville Alcott's organization. Instructor for the Secret Weapons. Story: Angelo Mortalli was a gangster taking whatever job might promote him up thru the ranks of the organization. After delivering a message to a rival gang, the recipient of the message was killed and Angelo was framed for the murder. Angelo turned himself in and was convicted for the murder. On the way to serve a life sentence he was offered to turn state evidence in exchange for a new life. While in protective custody Angelo was kidnapped and taken to Project Rising Spirit where his was used as a guinea pig for the bloodshot process. The Rising Spirit Project was a project, lead by Hideyoshi Iwatsu, on cybernetically enhancing humans. The process in which they replaced his blood with nanites should have made Angelo into an obedient killing machine . The bloodshot process was interrupted by Geoff McHenry allowing Bloodshot to escape. Unfortunately the process erased all Angelo's memories of his previous life . It was later revealed that Mortalli was a harbinger, which is why he was not killed by the infusion of the nanites . Bloodshot later found out about his past as Mortalli but left it behind [2-3]. The memories of his past were recovered later . Later the original process was finished by Iwatsu's son Tanaka, when he tried to revive his father. The project was a partial success. Bloodshot became a mindless killing machine, which went on a rampage and irrevocably ruined the chance for the revival of Iwatsu . The bloodshot programming was reversed by Colin King and Bloodshot returned to normal . Having suppressed the program, the nanites shortly after expelled part of the programming, creating Rampage, a dark version of Bloodshot . Due to his friendship with Gilad, the Eternal Warrior, he was introduced to Neville Alcott, and did some missions for Alcotts's organization. With the introduction of the Secret Weapons program, Bloodshot was hired as trainer . Bloodshot became romantically involved with Alcott's daughter Jillian and ended up getting her pregnant. Jillian gave birth to two sons who were changed into silicon beings by Proteus and were killed in the battle between Bloodshot and Proteus [9-10]. Skills & abilities: Angelo Mortalli is a harbinger with the ability to communicate directly with computers and control electronics. The nanites gives him control of many of his body's processes giving enhanced strength, hearing and healing. In the nanites are also programs for use of weapons, martial arts, strategy and other combat related subjects which can be uploaded for use. 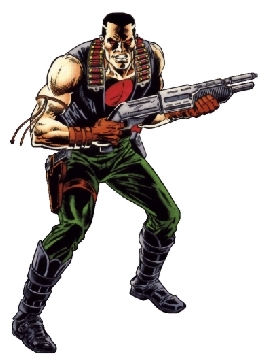 Equipment: Bloodshot carries a range of weapons, but generally favors handguns and katanas.